From the earliest times, humankind has been obsessed by monsters. As is evidenced by the fact that an entire month-long blogosphere event can be organized around horror stories, our species is fascinated by the things that scare us. …Rozin, along with many others in his field have a theory that there is pleasure for the mind in watching the body react negatively while knowing perfectly well that nothing bad is actually going to happen. The enjoyment, they suggest, comes from a sense of mental mastery over the body that is responding in a knee-jerk reaction. To put this information in context, Kaplan describes two different studies, one of people who like very spicy foods and another of people who love horror movies. Both groups don’t just claim to enjoy the actual experience, which others would find to be physically or psychologically painsful, but they also claim to enjoy the accompanying physical reactions, whether it be sweating from spicy foods or a racing heart from the scary movie. After establishing the human penchant for the things that frighten us, Kaplan works through ten different categories of monsters, from giant animals (many early monsters, King Kong), to the beasties of the water (Leviathan, Jaws) to the created (the Golem, Frankenstein, Terminator). Of course he also discusses werewolves, vampires, Medusa, ghosts, and the like, but what is particularly interesting about each of these ten categories is that by grouping them together in these categories, it is easier for Kaplan to look at the root cause(s) of the fear. For instance, the connection between rabies and the fear of those “cursed by a bite” such as vampires and werewolves. 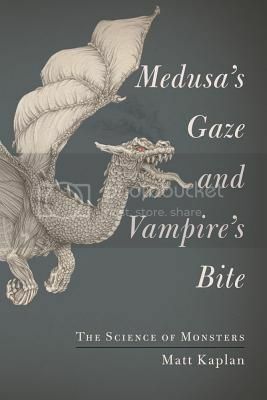 Although Medusa’s Gaze and Vampire’s Bite is a particularly relevant read around Halloween, it is a smart exploration of the connection between man and monster that is a good enough read to pick up at any time. Highly recommended. October 22nd, 2012 | Tags: monsters, Publisher: Simon & Schuster, review copy, science | Category: Misc. I have to admit I love a good horror movie. This sounds like an interesting book explaining why that is so. Added it to my to be read list. I have never been much for horror movies or scary stories. I am startled by pretty much anything- a chair scraping the floor has been known to make me jump 3 feet in the air. I think I would like to read this book to discover why I might NOT like scary stuff and perhaps train myself to enjoy them more because I know I am missing out. It sounds like this one is was written with me in mind!